Seaborn Barnes, aka: “Nubbin’s Colt” (1849-1878) – Born in Cass County Texas around 1849, Barnes never really attended school and was illiterate when he went to work as a cowboy in his early teens. Never able to hold his liquor well, he was involved in many barroom fights and was jailed for a year in Fort Worth over a shooting that occurred when he was just 17. He was arrested again in 1874 in Calahan County, but soon escaped. In 1878, Barnes joined up with the Sam Bass Gang and soon became Bass‘ chief lieutenant, helping to rob several trains in the spring of 1878. 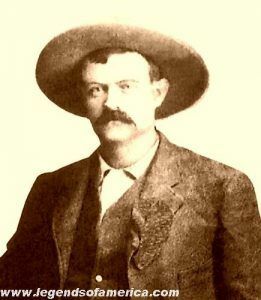 However, when they attempted to rob the bank at Round Rock, Texas on July 19, 1878, a new member of the gang – Jim Murphy, turned informer and the Texas Rangers were waiting. In the ultimate shoot-out that occurred, Barnes took a bullet in the head and was killed instantly. Though Bass was severely wounded, he made it to his horse and rode out of town along with another bandit by the name of Frank Jackson.